She calls her art a gift because it was not with her from her earliest days. She drew as a child and painted some with an aunt, but art was little more than a pastime in her childhood in McAdenville, also known as Christmas Town USA. “Growing up there was so much fun,” she says. “I have really fond memories. McAdenville had its nice little jewels. I’m glad I grew up in the days when we got outside.” She lived near Aviary Gardens, a small zoo that was part of Pharr Yarns, the mill that was the hub of the town. It was an amazing thing, she says, to be able to walk down the street from her house and see exotic animals and birds through the zoo’s gates. Her twin sister became a scientist. “We’re as fraternal as they come,” Alexander says. When it came time for her to choose her own life path, she was unsure of what she wanted to do. She began taking classes at Gaston Community College and working at the Gaston Gazette evenings. “I was learning graphic design from the basics up,” she says. A job in graphic design brought her to Asheville, where friends lived, in 1997. When, years later, she was laid off from her graphic design work, she was at a loss about what to do moving forward. “I was playing with stained glass during that time,” she says. “It truly was a hobby.” Her work was being displayed at Woolworth Walk. When her partner encouraged her to take a year off to find out what she wanted to do, she began playing with paint while still creating her glass art. Little Sadie, her Chihuahua, was the inspiration for her early paintings. Sadie’s markings gave her the appearance of wearing a mask. Alexander began painting colorful animals wearing all sorts of eyewear. She was known for the whimsy and for the punny titles of her pieces. One, a commissioned work, is titled There Really Are Bigger Fish in the Sea. It depicts two cats underwater with scuba gear. Five different fish swim around them and two sets of divers’ flippers are visible at the top of the painting. The man who commissioned the work wanted him and his partner, his two cats and his five pet fish in the work and Alexander was happy to oblige. He even described the personalities of the fish, she says, as background to her painting them. “With early paintings, I was just entertaining myself,” she says. It was a series of health issues that set her on a different path with her work. When she began having pain in her hand, she, at first, tried resting, then picking up the brush again. A special easel that supported her hand as she worked helped. “I was able to continue painting like that for a while,” she says. But when the condition did not ease, she picked up bigger paintbrushes. Broad brushstrokes changed her style, she says. 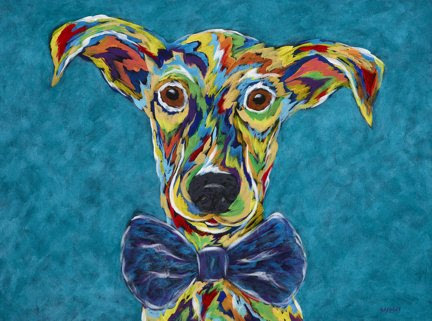 She completed a painting of a dog titled My Future’s So Bright, then set it aside, unsure of how she had done it. Rather than carpal tunnel pain as she had imagined, her condition turned out to be rheumatoid arthritis. Around the same time, she also began having trouble with her eyes. That was diagnosed as diabetic macular edema. Today her conditions are managed and she continues to paint, but in her newly discovered style rather than her original one. “You have to have a style that’s recognizable,” she says. She begins with a black background on her canvas that gives rich undertones to the bright acrylics she applies with big, broad strokes. Like her, she has found, there are lots of animal lovers out there. “Asheville’s such a dog city,” she says. 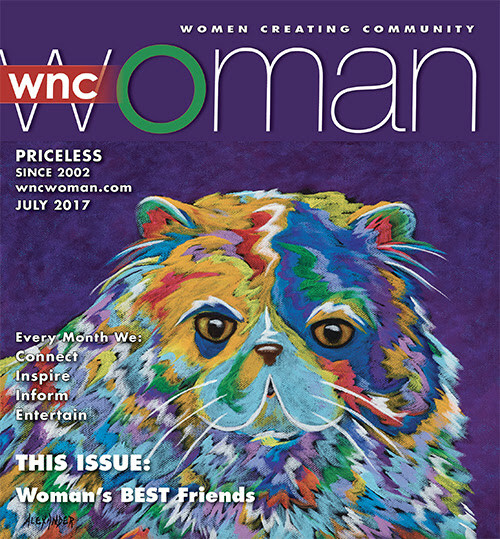 Many of her works are commissioned by pet owners who want lasting tributes to their furry friends and those requests come from all over. 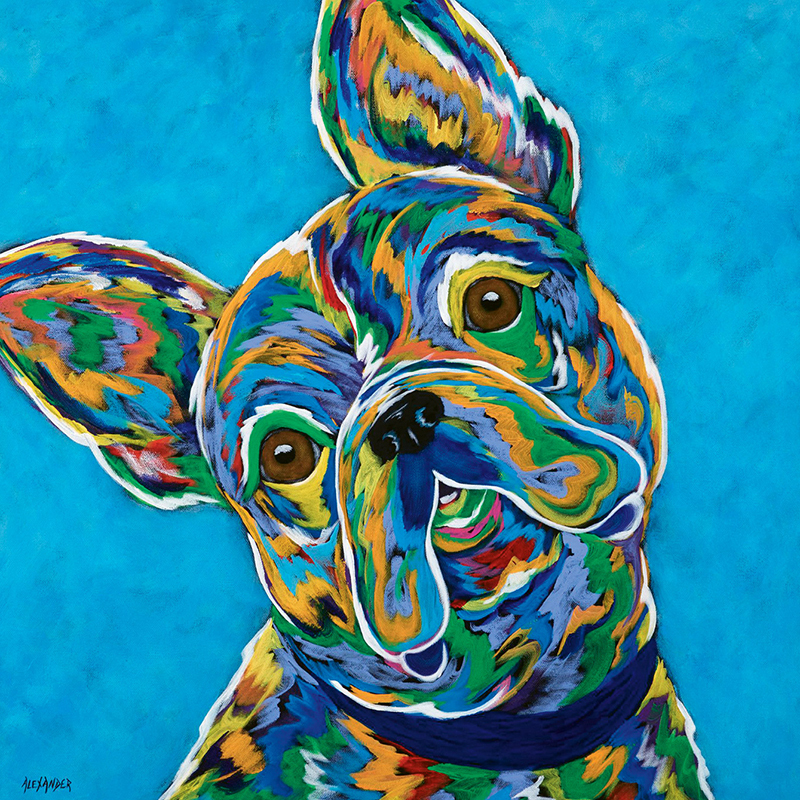 One couple bought one of her pieces for their collection that also contains an original George Rodrigue painting of the Blue Dog. 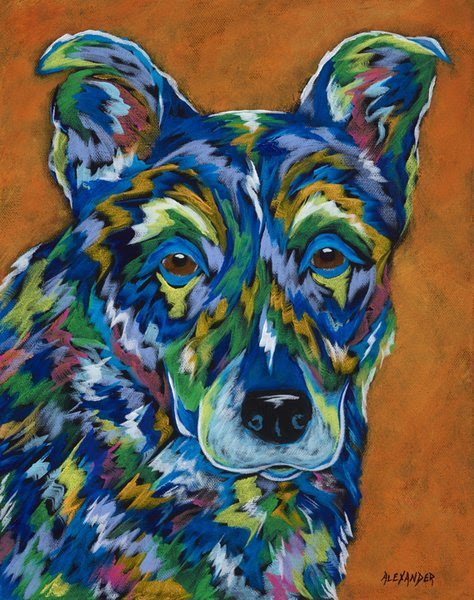 Three of her paintings have gone to Japan and she has exhibited at the American Kennel Club Museum of the Dog in Missouri. Her beloved Sadie, the inspiration for it all, passed away in 2015, but, Alexander says, “She will forever be a part of my art.” Today Alexander is “doggie mom” to Maya and Frida. 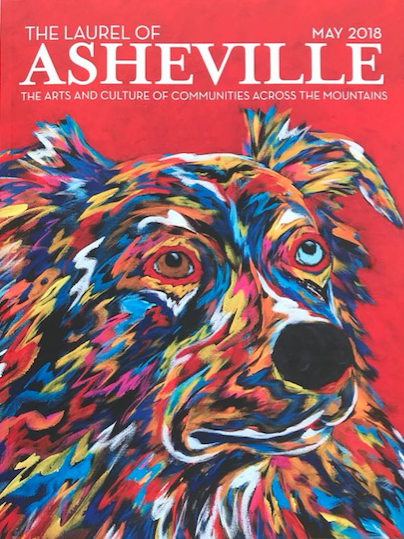 Angela Alexander’s work may be found at several galleries in the Carolinas, including Woolworth Walk and Aloft Asheville Downtown, and at Seasons at The Omni Grove Park Inn. Her working studio is located in NorthLight Studios at 357 Depot Street in Asheville’s River Arts District. Hours are Thursday through Saturday, 11 a.m. to 4 p.m., and by appointment. To learn more, visit angelaalexanderart.com. 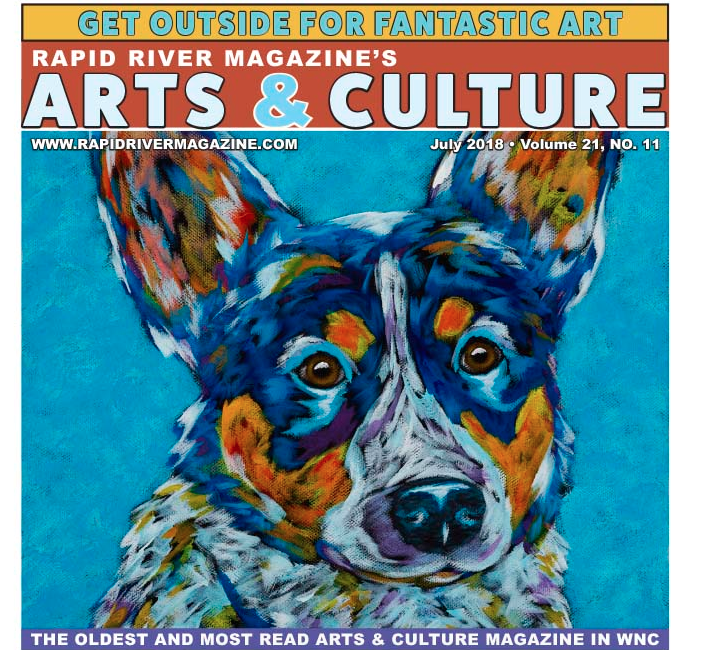 River Arts District artist Angela Alexander paints vibrant, energetic pet portraits. Her work comprises many animals–horses, cows, cats, and pigs to name a few–but her specialty is dogs.“I love dogs. They are so full of love and can have such unique personalities. My early work was actually inspired by my late Chihuahua, Sadie,” Alexander said. “We had a very special connection. She was very shy, so most people didn’t get a chance to see it, but [...]"